I am not eating sugar this week. Well, I haven’t caved in yet:) So far, so good! I just need a week to detox a little. I am still eating fruit, but no desserts and that means no cookies. Gasp! I don’t think I have ever gone a week without eating a cookie! Well, just because I am off sugar doesn’t mean that you have to feel deprived. I am going to live vicariously through all of you because you are going to be eating Brown Butter Salted Caramel Snickerdoodles. I made these cookies a few weeks ago and I think I ate the entire batch. Hence, the need for a sugar detox:) These cookies were so worth the cookie binge! 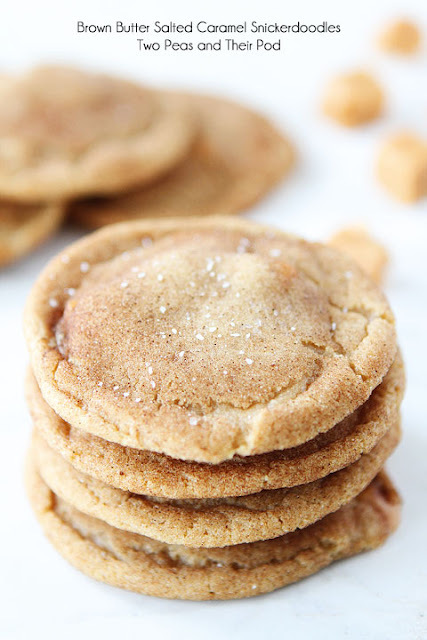 Think classic snickerdoodles but SO much better…and I love classic snickerdoodle cookies. This snickerdoodle recipe is just AMAZING! In a medium bowl, Whisk together the flour, baking soda, cream of tartar, cinnamon, and salt. Set aside. In the bowl of a stand mixer, combine the brown butter and sugars. Mix until blended. Beat in the egg, egg yolk, vanilla extract, and Greek yogurt and mix until combined. Slowly add in the dry ingredients and mix until just combined. Form the dough in a ball and cover with plastic wrap. Chill in the refrigerator for at least 30 minutes. You can chill the dough overnight or for up to 2 days. When ready to bake, preheat the oven to 350 degrees F. Measure about 2 tablespoons of dough and roll into balls. Flatten the ball slightly with the palm of your hand and place a piece of caramel in the center of the dough. Wrap the cookie dough around the caramel, making sure the caramel is completely covered with dough. In a small bowl, combine the cinnamon and sugar. Roll the balls in the cinnamon-sugar mixture. Place dough balls on a large baking sheet that has been lined with a Silpat baking mat or parchment paper. Make sure the cookies are about 2 inches apart. Sprinkle the cookie tops with sea salt. Bake the cookies 8-10 minutes or until the edges of the cookies begin to turn golden brown. The centers will still be soft. Don’t over bake. Cool the cookies on the baking sheet for 2-3 minutes, or until set. Transfer cookies to a wire cooling rack and cool completely. Note-if you want to make bigger cookies, you can put 1/2 a caramel in the center, just make sure the cookie dough is covering the caramel so it doesn’t ooze out. I like to use Trader Joe’s Fleur De Sel Caramels because they are softer and have hint of salt. I cut one in half for the cookies. 0 Response to "Brown Butter Salted Caramel Snickerdoodles"